Did You Know Philly Has Its Own World Cup? In Philadelphia, sports unify people across all cultures and demographics. 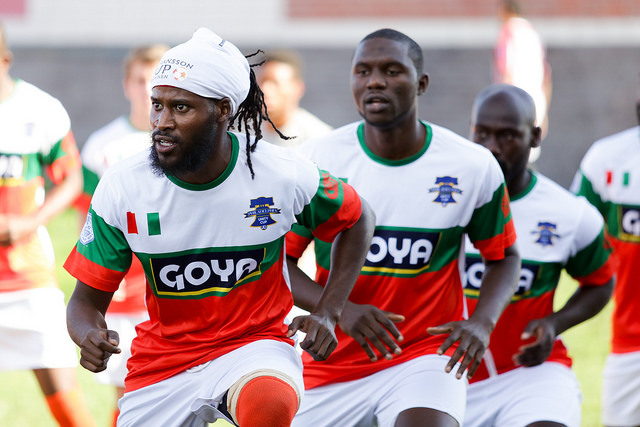 The Philadelphia International Unity Cup, presented by Goya, is no exception. The tournament has been uniting the city’s neighborhoods and celebrating its diverse immigrant communities through soccer for the past three years. This year, the Unity Cup had a record 52 teams representing countries from around the world compete in the tournament, which kicked off in August and runs through October. Seydou Ba is one of the athlete’s in this year’s Unity Cup. He has been playing in the tournament since its 2016 debut. Ba is no stranger to competition, as he used to play for Holy Family University before graduating in 2012. Even though the 29-year-old is not able to play for his country (because there aren’t enough local immigrants to form a team), he has found a home playing for the Ivory Coast alongside his friends. One of the best things about Unity Cup games is that they’re always free and according to Ba, you don’t even have to be a soccer enthusiast to get into the games. “It’s not just about soccer, it’s about learning about different types of people and interacting with them. I wish people would actually just come out and get to experience that as well,” he said. Ba’s team has earned a spot in the championship game, which will take place on Saturday, October 13 at Talen Energy Stadium, home of the Philadelphia Union. Learn more about the Unity Cup and full lineup of free activities on championship day at https://unitycup.phila.gov/. Sign up for the latest from Campus Philly!